Tunis (Arabic: تونس, Tūnis) is the capital and largest city of the Tunisian Republic. It is the center of Tunisian commerce, as well as focus of political and administrative life in the country. Tunis was founded by Berbers during the second millennium B.C.E.. It was controlled by Phoenicians, then by the Romans. It became the capital city of the Arab Aghlabid dynasty and was the base for the privateer Barbarossa Hayreddin. Tunis was captured by the King of Spain, then the English, and it was invaded by France. Tunis was used by Nazi Germany as a supply depot during World War II, and since gaining independence in 1945, it was the center for the Arab League and the Palestinian Liberation Organization. The Medina of Tunis has been a UNESCO World Heritage Site since 1979. The ancient city of Carthage is located just north of Tunis along the coast. The expansion of the Tunisian economy in the last decades is reflected in the booming development of the outer city where one can see clearly the social challenges brought about by rapid modernization in Tunisia. Tunis is located in north-eastern Tunisia, on a large Mediterranean gulf, (the Gulf of Tunis), behind the Lake of Tunis, and the port of La Goulette (Halq al Wadi). The city extends along the coastal plain and the hills that surround it. Tunis has a typical Mediterranean climate, with hot summers and mild winters, when there is the most rainfall. Spring and autumn are pleasant seasons. The average maximum daytime temperature in January is 57.2°F (14°C), rising to an average maximum of around 89.6°F (32°C) in July. Mean annual precipitation is 17.4 inches (441mm). Environmental issues include health risks posed by ineffective toxic and hazardous waste disposal, water pollution from raw sewage, and limited natural fresh water resources. The medina, located at the center of the city, is a dense agglomeration of alleys and covered passages, full of intense scents and colors, boisterous and active trade. A surfeit of goods are on offer, ranging from leather to plastic, tin to the finest filigree, tourist souvenirs to the works of tiny crafts-shops. 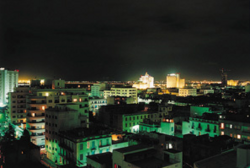 Just through the Sea Gate (also known as the Bab el Bahr and the Porte de France), begins the modern city, or Ville Nouvelle, transversed by the grand Avenue Bourguiba, where the colonial-era buildings provide a contrast to smaller older structures. Beyond lie the suburbs of Carthage, La Marsa, and Sidi Bou Said. The Carthage room in Tunis' Bardo Museum, originally a thirteenth century Hafsid palace. In the second millennium B.C.E., a town, originally named Tunes, was founded by Berbers and also occupied by Numidians. In the ninth century B.C.E., Phoenicians took over the city. Berbers took control of Tunis in 395 B.C.E. but soon lost it when Agathocles, who was tyrant of Syracuse (317-289 B.C.E.) and king of Sicily (304-289 B.C.E. ), invaded Africa and established his headquarters there. When Agathocles left Africa, the Carthaginians took control once again. In 146 B.C.E., the Romans destroyed Tunis (along with Carthage) during the Third Punic War between Carthage and Rome. The city was rebuilt under the rule of the first Roman emperor Augustus (27 B.C.E. to 14 C.E. ), and became an important town under Roman control and the center of a booming agricultural industry. Muslim invaders destroyed Carthage a second time in 698 C.E., and Tunis became the capital city of the Arab Aghlabid dynasty (800–909). It was at this time that the medina of Tunis was built. From the twelfth century to the sixteenth century, the old city was controlled by the Almohad and the Hafsid Berber dynasties. During this time, Tunis was one of the richest and grandest cities in the Islamic world, with a population of about 100,000. 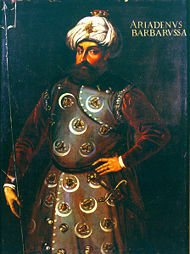 The Ottoman Empire took nominal control of the city in 1534 when Barbarossa Hayreddin, (c. 1478–1546), who was a Turkish privateer and Ottoman admiral who dominated the Mediterranean for decades, captured it from the Hafsid Sultan, Mulai Hassan. Mulai Hassan fled to the court of Charles V, Holy Roman Emperor King of Spain, who had suffered at the hands of the corsairs operating out of Djerba, Tunis and Algiers. Charles agreed to reinstate Mulai-Hassan in exchange for an acceptance of Spanish suzerainty by Mulai-Hassan. A naval expedition led by Charles himself was dispatched in 1535 and the city was quickly recaptured. The victory against the corsairs is recorded in a tapestry at the Royal Palace of Madrid. 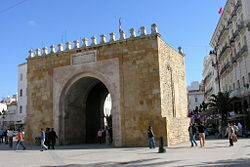 In 1539, Tunis passed into the hands of the Ottoman Turks, but it was retaken by the Spaniards in 1573, who held it until 1574 when the Ottomans retook the city. After 1591, the Ottoman governors (Beys) were relatively independent, so piracy and trade continued to flourish. 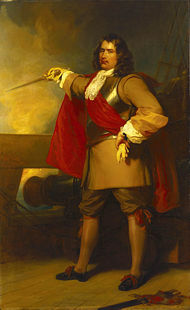 In April 1655, English Admiral Robert Blake (1599—1657) was sent to the Mediterranean to extract compensation from states that had been attacking English shipping. Only the Bey of Tunis refused to comply, with the result that Blake's 15 ships attacked the Bey's arsenal at Porto Farina (Ghar el Melh), destroying nine Algerian ships and two shore batteries, the first time in naval warfare that shore batteries had been taken out without landing men ashore. In the spring of 1881, France invaded Tunisia, claiming that Tunisian troops had crossed the border to Algeria, France's main colony in Northern Africa. The French occupied Tunis from 1881 to 1956, having established a protectorate system of administration that recognized the nominal authority of local government. In those years there were huge European colonies (like the Tunisian Italians) in Tunis, and the city experienced a great expansion with the creation of new boulevards. During World War II the Axis forces of Germany, Italy, and Japan held Tunis from November 1942 to May 1943, their last base in Africa. Violent resistance to French rule boiled up in 1954. Independence from France was achieved on March 20, 1956, as a constitutional monarchy with the Bey of Tunis, Muhammad VIII al-Amin Bey, taking the title of King of Tunisia. In 1957, Habib Bourguiba (1903–2000) became prime minister, immediately abolishing the monarchy, and establishing a strict state under the Neo-Destour (New Constitution) party. He dominated the country for 31 years, repressing Islamic fundamentalism and establishing rights for women unmatched by any other Arab nation. The Arab League, which represents 22 Arab nations, transferred its headquarters to Tunis in 1979 in response to Egypt's peace with Israel, but it has been headquartered back in Egypt since 1990. The Palestine Liberation Organization also had its headquarters in Tunis, from the 1970s to 2003. In 1985, the PLO's headquarters was bombed by the Israeli Air Force, killing approximately 60 people. 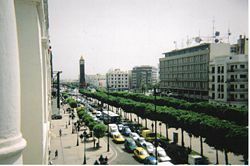 Avenue Habib Bourguiba seen from the Carlton Hotel. Tunisia is a republic in which the president, who is chief of state, is elected by popular vote for a five-year term, and has no term limits. The prime minister, who is head of government, is appointed by the president. There is a chamber of deputies, or Majlis al-Nuwaab, comprising 189 members elected by popular vote to serve five-year terms, and the Chamber of Advisors, comprising 126 seats of which 85 members are elected, and 41 members are presidential appointees. Tunisia is dominated by a single political party, the Constitutional Democratic Rally Party. Tunis is the capital of the Tunis Governorate, which is one of Tunisia's 24 governorates, each of which are divided into 262 districts (mutamadiyat), and further subdivided into delegations. Carthage, Le Bardo, La Goulette, La Marsa, and Medina are among the 22 delegations of Tunis. These are further divided into municipalities. 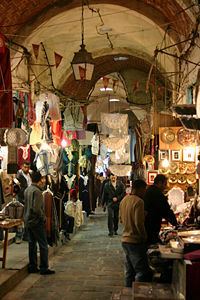 One of the 'indoor' streets that are part of the Market (Suuq or Souk) in Tunis. Tunisia has a diverse economy, with important agricultural (olives and cereals), mining, tourism, and manufacturing sectors. Governmental control of economic affairs lessened over the decade to 2008 with increasing privatization, and simplification of the tax structure. Progressive social policies also have helped raise living conditions in Tunisia relative to the region. Per capita GDP was estimated at $7400 in 2007. Tourism provides a significant portion of the city's income. According to statistics released in December 2008, Tunisia hosted, during the first 11 months of 2008, around 6.6 million tourists, an increase of 3.7 percent on the previous year. Manufactures include textiles, clothing, carpets, cement, metal building structures, and olive oil processing. There are superphosphate, metallurgical, machine, and electrical industries, as well as railway workshops. La Goulette, the port, has thermo-electric plants, and Maqrīn has a lead smelter. The A1 motorway connects Tunis with Sfax to the south, the A3 connects Oued Zarga and Béja to the west, while the A4 is the link with Bizerte. Multi-lane auto-routes surround the city and serve the increasing number of privately owned cars. The Tunis-Carthage International Airport is located northeast of the city. There is a network of public transport including buses, an above-ground light rail system (le Metro), as well a regional train line that links the city center to its closest northern suburbs. Tunis had a population of 1,200,000 in 2004. Informal estimates place the population of greater Tunis at nearly four million. Ninety eight percent of Tunisia's population were Arab, one percent were European, while Jewish and others totaled one percent. Arabic is the official language, and one of the languages of commerce, while French is used in commerce. Muslims make up 98 percent of the population, Christians one percent, Jewish and other one percent. Tunis is the site of the University of Tunis, founded in 1960, as well as Tunisia Private University. The ruins of Carthage, the old capital of the Carthaginian Empire, are located along the coast to the northeast. The area has remains of second century C.E. Roman thermal baths, as well as the remains of an aqueduct built by the Romans to link Mount Zaghwān to Carthage. The Great Mosque, including the Muslim University and library. Aghlabid Ez-Zitouna Mosque ("Mosque of the Olive"), built in 723 by Obeid Allah Ibn-al-Habhab to celebrate the new capital. The Dar-al-Bey, or Bey's Palace, which comprises architecture and decoration from many different styles and periods and is believed to stand on the remains of a Roman theater as well as the tenth century palace of Ziadib-Allah II al Aghlab. 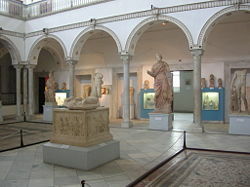 The Bardo Museum, originally a thirteenth century Hafsid palace, which contains a collection of Roman and other antiquities of interest from Ancient Greece, Tunisia, and from the Arab period. Tunis benefits from its position as the capital, largest city, and commercial and industrial center of Tunisia, as well as from the steady flow of tourists visiting World Heritage Sites at the Medina of Tunis, at Kairouan, the Amphitheatre of El Djem, Dougga, Ichkeul National Park, the Medina of Sousse, the Punic Town of Kerkuane and its necropolis, and the site of Carthage. Yet, it faces a number of challenges. Inhabitants of Tunis face health risks posed by ineffective toxic and hazardous waste disposal, water pollution from raw sewage, and limited natural fresh water resources. And although Tunisia has a better standard of living than other nations in the region, it will need to reach even higher growth levels to create sufficient employment for an already large number of unemployed as well as the growing population of university graduates. ↑ (French) Census of 2004 information National Statistical Institute. Retrieved June 15, 2012. World Fact Book. 2008. Tunisia Retrieved December 4, 2008. This page was last modified on 21 December 2015, at 20:01.